I am using the desktop version, but I sadly have never had any ads to watch so far @_@ I live in Germany, if that helps? o.o"
Yeah apparently outside the U.S. there's little to no ads for desktop. Oh yeah! I think staff said a while ago they're starting to implement new ad providers, so hopefully they can get international coverage too! Hi. Is there any latest update with regards to ads? I still can't get unlimited ads anymore. I only get around 100 coins per day. It's really sad. I miss being able to earn more coins. I hope others who are experiencing this may get unlimited ads as well. 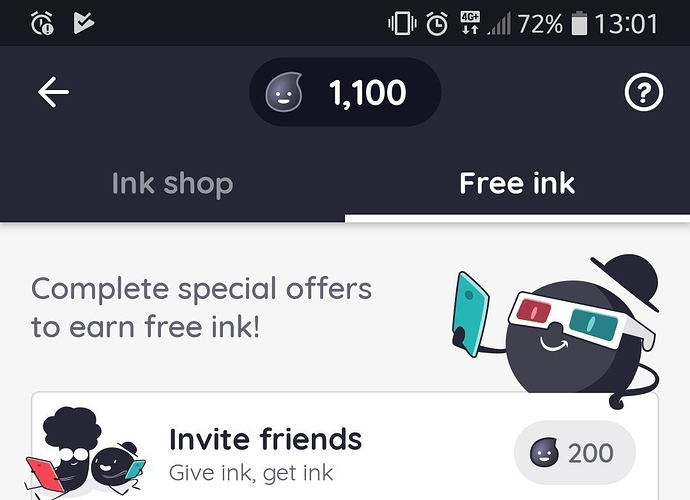 The new currency ink got implemented with the lasted update of the app. Havent been getting any ads on the desktop for a minute, but I get ads on the app. I only got like, 10 or so ads on apps every few days. I've been saving for inksgiving but I only manage to add a little less than 800... these months. I rarely gotten any ads this one year. And though I rarely buy any novel or comics, my total ink only adds up to 2300 something. And I'm still having problems with the app where I can't click on anything except for the tabs? My only solution is to just delete the data and cookie. Any one still have this problem? @silverraven0 I'm having that issue on my tablet, but my phone has been working okay. We made some changes to the way rewarded video ads are shown so they should be showing more often now. This is especially true for Android and users outside of the US. So anyway, please let us know if they're showing more frequently than they were before. 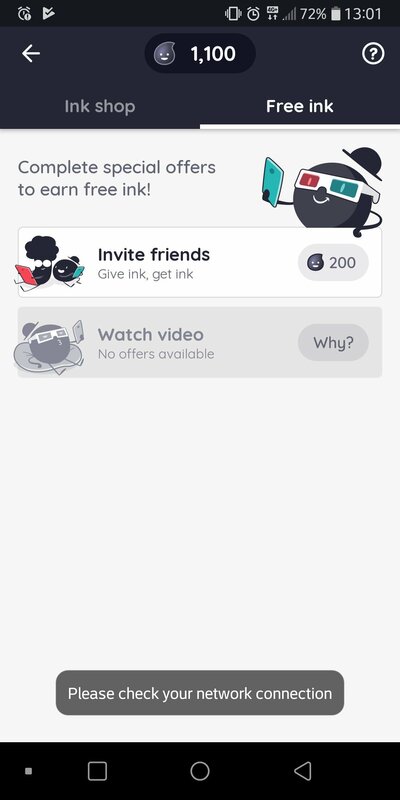 We're also in the final testing stages of adding even more ways to earn ink. So look for that real, REAL soon. I updated the mobile app and gave it a try and it works!!! _ Thank you so much!!! Still don't get any for desktop, but for the app I'm getting way more ads now compared to before (unlimited actually). Thanks!! Not only am I currently not getting any ads, but the app update has been wonking out on me- keeps popping up the "Inksgiving" prompt/box when I've visited it TONS of times(on the app). The app has been moving slow(freezing up at times) that I have to back out of it, and when it finally does work okay- NO ADS. As of now, I've stopped getting ads again. I don't know why. I hope there's an explanation for this. Has there been any changes recently? Are you still able to watch unlimited ads as of now? I practically stopped getting ads a few days ago. I hope it's fixed soon. Is there still unlimited ads for you? I stopped getting ads recently. There are no ads to watch as of now. I wonder why.